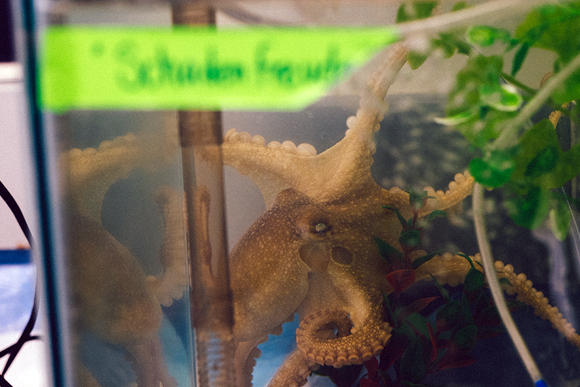 Meet Schadenfreude, the Ragsdale lab's pet octopus. 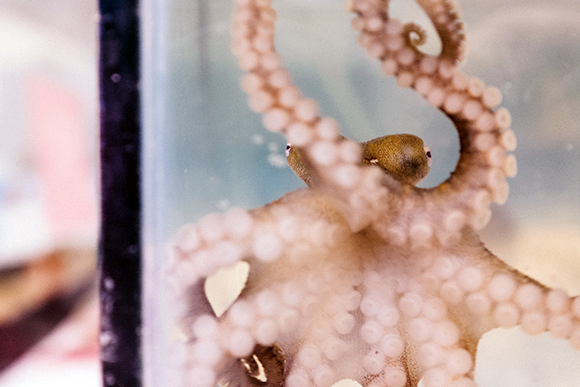 Schadenfreude, office pet in the Cliff Ragsdale lab, made his media debut in the UChicago Medicine online newsletter Science Life last December, when he was seven months old. 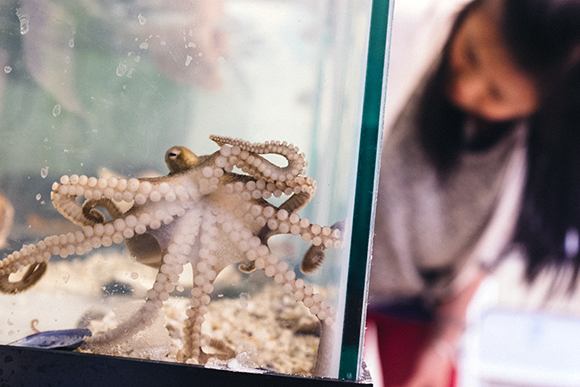 His name, pronounced Scooten-froodie, comes from a YouTube video that his doting caretakers, graduate students Carrie Albertin, SM’12, and Z. Yan Wang, watched over and over again on a stressful day. 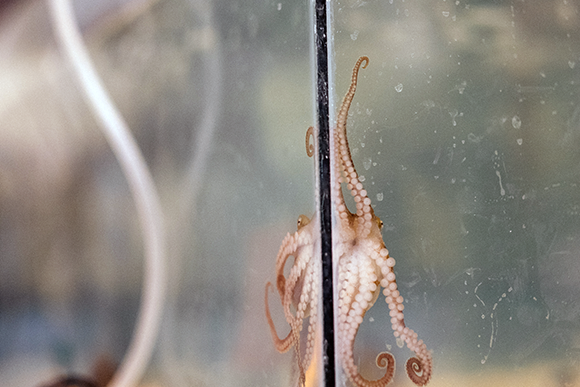 By the time the Core visited in April, time was running out for Scootie; Octopus bimaculoides live only a year or so. He’d also been joined by two younger octopuses, Scootie-twotie and Oscar the Grouch. “Scootie-twotie is incredibly active and gregarious,” says Wang, “and Scootie was like that. 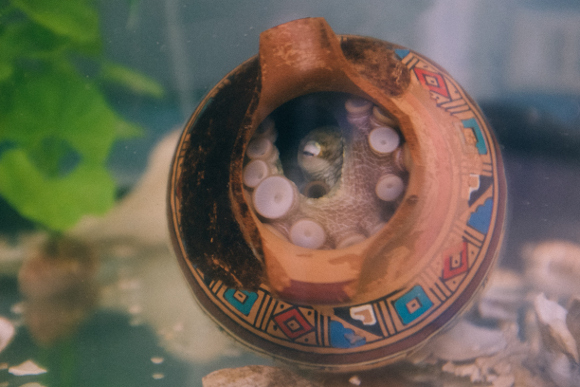 “They have a lot of personality,” says Albertin, who calls octopuses “the cats of the sea.” (“Aw, Scoots,” she says, as he backs shyly into a clay pot in his tank. 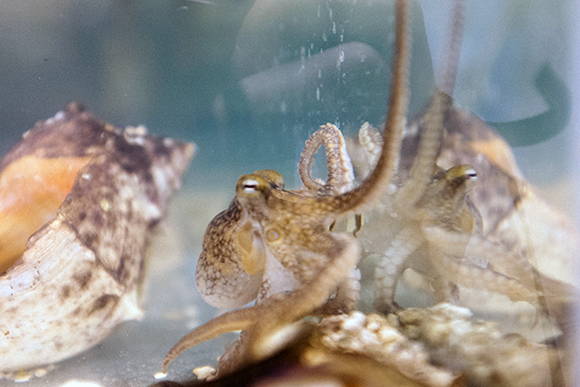 “You’ll fit in there in a minute.”) They’re choosy about their food, preferring live crabs, clams, and shrimp. When annoyed about something, they will squirt you right in the face.